ELECTRONIC ASSEMBLY also offers part of its LCD Dotmatrix series in snap-in housings for fast, uncomplicated mounting. All displays are addressed via the serial RS-232C interface as standard. Optionally, control via RS-422 is also possible. Data transmission rates of 300, 1,200, 2,400 and 9,600 baud are selectable. The displays are ready for operation. All cursor controls, such as line feed, are executed automatically. The snap-in variants are available for three text displays with 1×8, 2×16 and 4×20 characters. 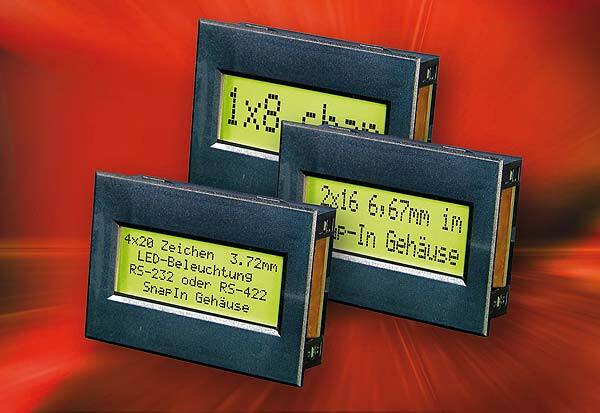 The compact text displays are available with one, two or four line displays, as EA SER081-92NLED, EA SER162-92NLED or EA SER204-92NLED. They are able to display the complete ASCII code, including German diacritics and “ß”. The installation dimensions (70.5×48.5 mm) and the viewing window (56.5×22.0 mm) are identical for all of them. The single-line version EA SER081-92NLED can display eight characters with a height of 11.48 mm. The two-line model EA SER162-92NLED displays 16 characters each with a height of 6.68 mm on two lines. The four-line panel EA SER204-92NLED consists of four 20 characters with a height of 3.72 mm. The text displays can be connected directly to a PLC, as they can be powered with 9 to 35 V same as with 5 V. The current consumption for all three models amounts to 140 mA. Up to 64 displays can be individually addressed at a serial interface via adjustable addressing. Optionally, they are also available with a keyboard input for a 5×5 matrix. Its integrated panel lighting can be switched on and off by software command. Under the designation EA 0099-KE ELECTRONIC ASSEMBLY supplies a snap-in housing for the dynamic Dotmatrix module EA DYN218-N2LED. This display can display a maximum of 8×21 characters in four font sizes, also in mixed display. In addition, it loads small graphics, icons or logos via the RS-232 interface (optionally also RS-422). This allows displays to be adapted individually and texts and measured values to be highlighted as required. With a minimum of effort, situation-adapted display content can be realized. Considering the compact external dimensions (93x70x28 mm), the module with 71.6×40 mm still offers a generous viewing window. It runs on 5 volts and draws a maximum of 220 mA when the LED lighting is activated. ELECTRONIC ASSEMBLY offers a variety of further displays with RS-232 interface. A cover frame made of plastic is an integral part of the delivery. These include 1 to 16 line displays with 8 to 40 characters per line.